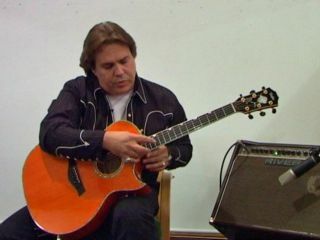 Doyle Dykes is famous for his frighteningly good fingerstyle guitar, into which he frequently throws harmonics to make the sound more interesting. In this video lesson, Doyle shows you his approach to harp harmonics. A harp harmonic is a harmonic where the picking hand is used to stop the string from ringing out clearly at the same time as picking it. It´s simply a different way of playing a normal, open string harmonic. To play a harp harmonic on an open string, lightly rest the tip of your index or middle finger of your picking hand (whichever feels easier) on the string, directly over the 12th fret. Then pick the string with your thumbnail, or, as Doyle does in the video, a thumb pick, and lift your ‘harping´ finger off just after you pick the note. When it comes to fretted harp harmonics, the process is exaclty the same - but it´s important to remember that wherever you fret the string, you must ‘harp´ with your picking hand finger exactly 12 frets above the fretted note for the harmonic to sound. For more information on Doyle, visit the official Doyle Dykes website.